In October, Gluskin Sheff economist David Rosenberg warned of a big red flag signaling a recession in the United States. The year-over-year change in the three-month moving average of nondefense capital goods orders excluding aircraft and parts (also referred to as “core capex”) had turned negative. Rosenberg considers this chart the purest look at what businesses are doing with their cash. Today’s durable goods report revealed a surge in core capex in January. 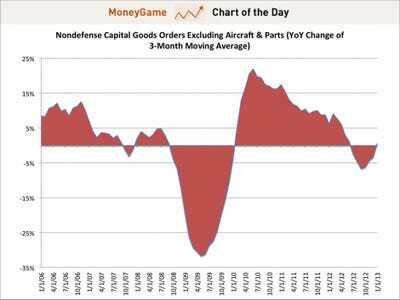 Nondefense orders ex-aircraft and parts jumped 6.3 per cent, way above economists’ estimates of a flat reading. Perhaps fiscal cliff fears have been allayed for now. Now – lo and behold – Rosenberg’s recession indicator has finally moved into positive territory, albeit only slightly. Is the U.S. economy out of the woods? Of course not – but at least at the moment, it looks like businesses are spending again. That seems better than the alternative.